Cat scratches can lead to bad infections without a good way to relieve it. I do get scratched by my cat from time to time during play time. This time I got scratched really bad and deep. Her nails were razor sharp and she caught me on the inner middle finger. It hurt like nobody’s business with blood dripping. I had to hold my other hand under it to prevent the dripping blood from getting everywhere. Here’s what I did to make it all better. The first step is always to clean it. I did this by holding my cat scratched finger under cold running water for a few minutes. Yes, it was very painful but necessary to flush out any bacterial germs that got in there. I did not have any of my regular supplies around that I get at the drugstore. I’ve used betadine solution and topical antibiotic cream in the past. My cat has scratched me badly before and I can tell you that on those past occasions using typical solutions, my finger got swollen and infected. This time I frantically tried to figure out what to do. I have lots of essential oils and knew that Melaleuca has natural antiseptic and anti-inflammatory properties. I made a blend of Melaleuca and Lavender essential oils. Lavender can be soothing for skin irritations. I applied the Melaleuca and Lavender blend after cleaning. I then covered the deep cut with a clean, sterile bandage. Yep, I have a good supply of those on hand! It really hurt bad for several hours. It may have even needed a stitch but I didn’t go to a doctor. It did take a couple of days to stop bleeding altogether. I changed the bandage 3 times a day, applying the essential oil blend to the cat scratch each time. I did this for about a week. To my surprise, my finger did not swell or get infected at all. It also healed in record time. Within a week, there were barely any signs that a deep cat scratch was there. I have no scar at all. A few days later, I took her to the vet to get her nails trimmed! 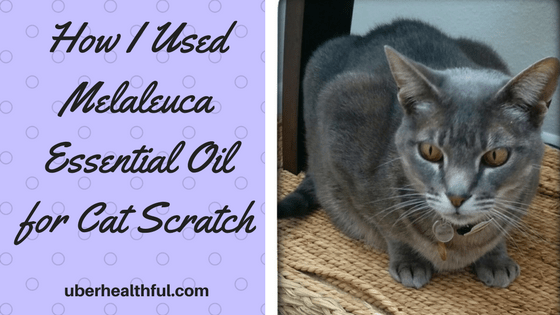 Using Melaleuca and Lavender essential oils for my cat scratch worked wonderfully for me. I am not a medical person at all, I am simply sharing with you how I healed my cat scratch and avoided infection. Always consult your own doctor if you get a bad scratch or bite from an animal. Learn more about how you can use essential oils!